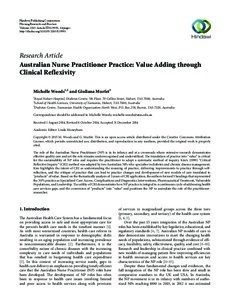 The role of the Australian Nurse Practitioner (NP) is in its infancy and at a crossroads where extensive research demonstrates effective quality care and yet the role remains underrecognised and underutilised.The translation of practice into "value" is critical for the sustainability of NP roles and requires the practitioner to adopt a systematic method of inquiry. Kim’s (1999) "Critical Reflective Inquiry" (CRI) method was adapted by two Australian NPs who specialise in diabetes and chronic disease management. Kim highlights the intent of CRI as understanding the meaning of practice, delivering improvements to practice through selfreflection, and the critique of practice that can lead to practice changes and development of new models of care translated to "products" of value. Based on the thematically analysis of 3 years of CRI application, the authors formed 5 headings that represented the NP’s practice as Specialised Care Access, Complications and Diagnostics Interventions, Pharmaceutical Treatment, Vulnerable Populations, and Leadership. The utility of CRI demonstrates how NP practice is integral to a continuous cycle of addressing health care services gaps, and the conversion of "products" into "value" and positions the NP to assimilate the role of the practitioner-researcher.